The Blood and Marrow Transplant Group of Georgia – The Blood and Marrow Transplant Program at Northside Hospital is a collaboration between The Blood and Marrow Transplant Group of Georgia (BMTGA) and Northside Hospital. Northside Hospital Cancer Institute, a nationally recognized treatment center for leukemia, lymphoma, myeloma, blood and marrow transplant, is now an authorized Kymriah ®, tisagenlecleucel, CAR T-cell treatment center. Please click Press Release for additional information. Patients up to the age of twenty-five with a diagnosis of B-cell acute lymphoblastic leukemia (ALL) that is refractory or in a second or greater relapse. Adult patients with relapsed or refractory large B-cell lymphoma after two or more lines of systemic therapy including diffuse large B-cell lymphoma (DLBCL) not otherwise specified, high grade B-cell lymphoma and DLBCL arising from follicular lymphoma. 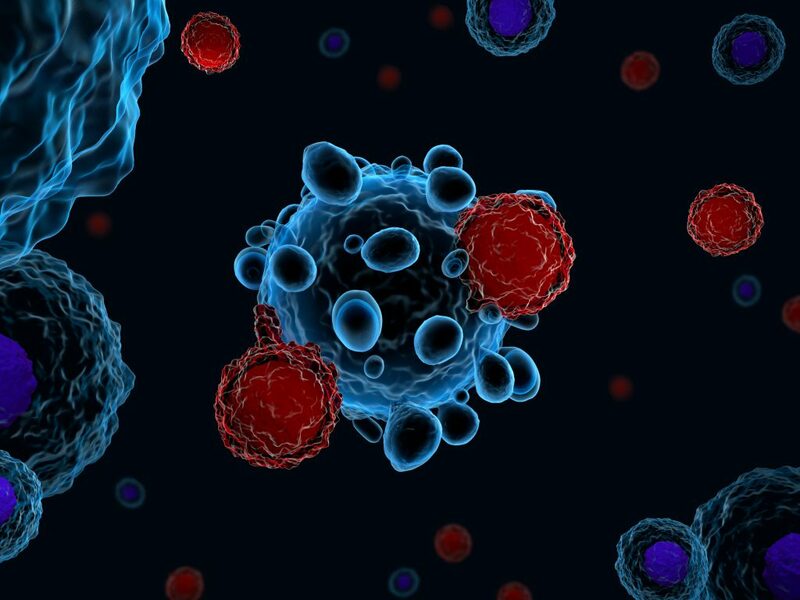 First-ever FDA-approved CAR T cell therapy for adult patients with certain types of non-Hodgkin-lymphoma (NHL) who have relapsed or refractory disease after receiving two or more types of treatment. 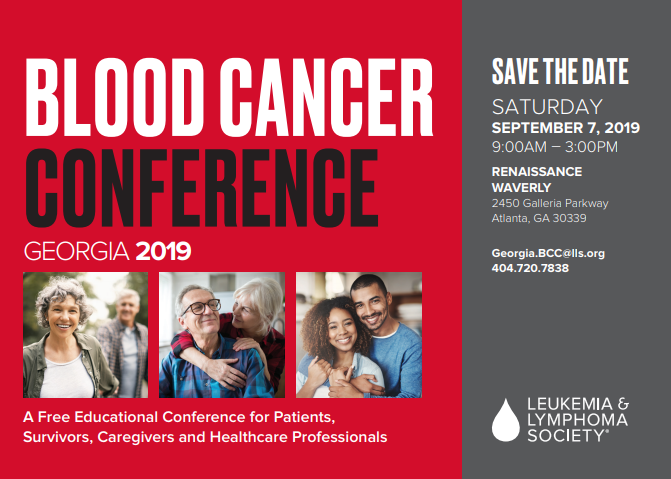 To refer a CAR T-cell patient, please call 404-255-1930. 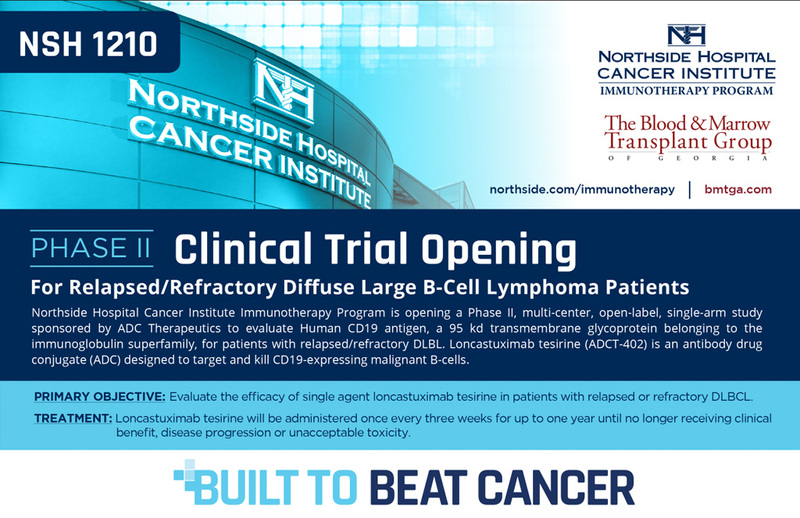 For more information about CAR T-cell therapy, please click Immunotherapy Program at Northside. Over the last two decades, outcomes of multiple myeloma (MM) patients have shown remarkable improvement due to incorporation of therapies such as immunomodulatory drugs (IMiDS), proteasome inhibitors and monoclonal antibodies (Daratumumab and Elotuzumab). Despite recent treatment advances for MM, most patients are expected to relapse, as the disease is still considered incurable. ASH has recognized our physicians, clinical research, and clinical BMT pharmacy teams for their commitment to participating in state-of-the-art blood and marrow transplant, leukemia and lymphoma clinical research trials. Dr. Scott Solomon will present Class II epitope level mismatch can predict chronic graft-versus-host disease and survival following haploidentical transplant using post-transplant cyclophosphamide and T-replete haploidentical cell transplantation using post-transplant cyclophosphamide for acute myeloid leukemia, acute lymphoblastic leukemia and Effect of transplant conditioning regimen intensity of outcomes. Dr. Melhem Solh will present The choice of induction regimen affects post remission survival of acute myelogenous leukemia (AML) patients with intermediate or poor risk disease, and in collaboration with academic medical centers, Dr. Solh and colleagues will present, Safety and efficacy of ADCT-402 (loncastuximab tesirine) a novel antibody drug conjugate in relapsed/refractory follicular lymphoma and mantle cell lymphoma: Interim results from the phase I first in human study. 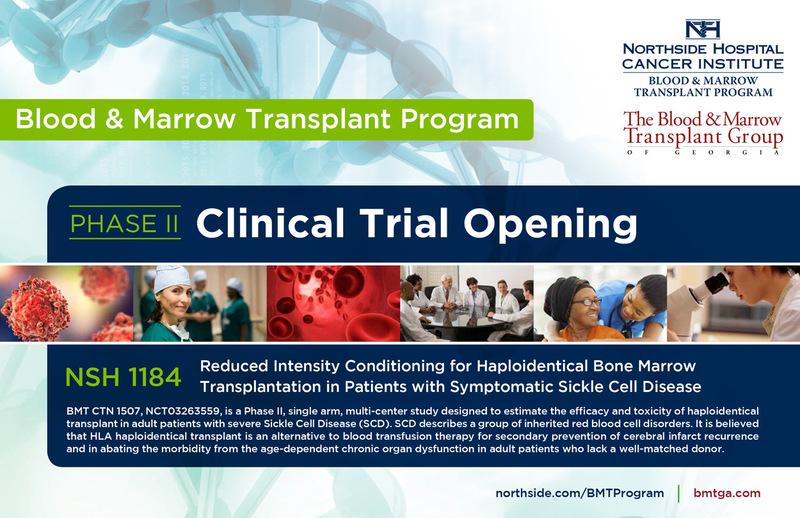 Having access to cutting-edge clinical research trials allows our patients to receive the most innovative treatment(s) available close to home and contributes to our program’s outstanding survival rates. Allogeneic hematopoietic cell transplantation (allo-HCT) is an established curative therapy for many patients with some hematologic malignancies that may be difficult to eradicate using alternative treatment. 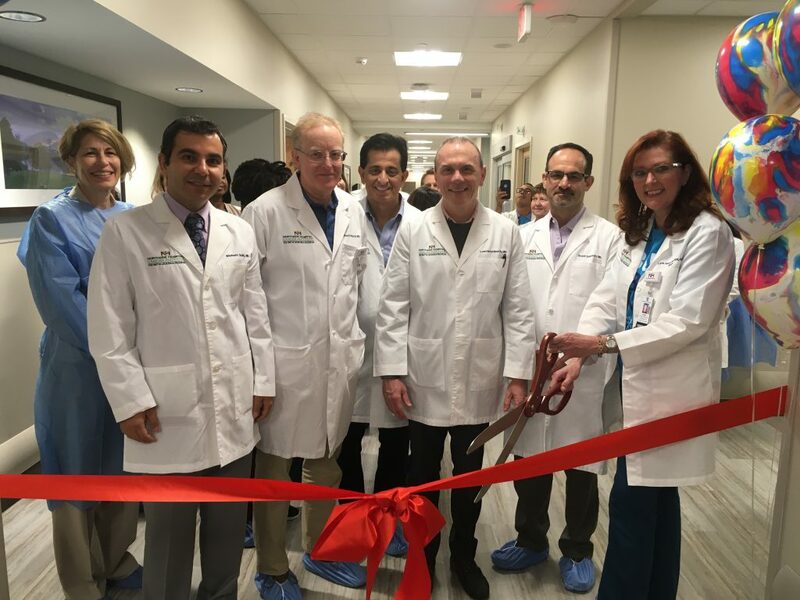 On May 1, 2018, The Blood and Marrow Transplant Group of Georgia physicians, program leadership and staff members participated in a ribbon-cutting ceremony to celebrate the opening of this new state-of-the-art inpatient unit. The unit is solely for patients undergoing blood and marrow transplant, leukemia, and immunotherapy treatment. To view a video from the ceremony, click here. For more information, please click Facilities. We believe our commitment to quality has consistently increased patient survival rates and lower treatment-related mortality rates. There were 174 adult and pediatric transplant centers included in the analysis. Please click Survival and https://bethematch.org/tcdirectory/index/60 for additional information. NSH-BMT program achieved BMT CTN Core Center Grant renewal funding for years 2017 - 2023. Past performance, current application, and PI leadership contributed to the grant renewal. 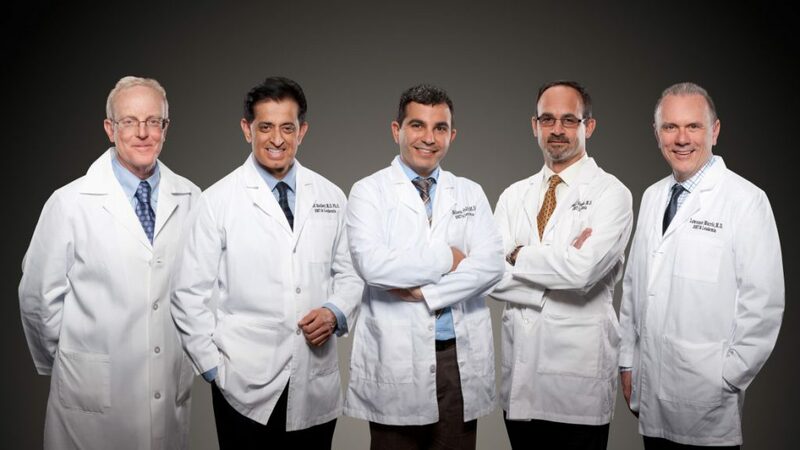 NSH-BMT applied as a consortium with University of Miami and Levine Cancer Institute. The National Heart, Lung, and Blood Institute (NHLBI) and the National Cancer Institute (NCI) provide BMT CTN research grant funding. Achieving this award is a validation of the efforts of each person in the program, the support of the administration, and leadership of the BMTGA physicians. For further information, please read Press Release. 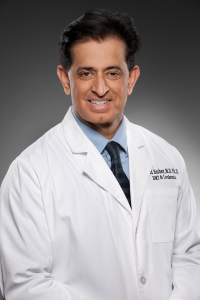 Dr. Asad Bashey, Northside Cancer Institute’s Blood and Marrow/Leukemia clinical research program medical director, recent radio announcement highlighted the program's outstanding survival outcomes, quality of patient care, and diverse medical team to help patients through their cancer journey. Please click here to listen to Dr. Bashey’s recent radio announcement. Disease stage at the time of transplant can have a significant impact on patient survival  appropriate planning and early donor identification are critical for optimal outcomes. The guidelines highlight disease categories that include patients at risk for disease progression, who should be referred for consultation for autologous or allogeneic HCT. If you have questions as to when to refer a patient for initial transplant consult, please call 404-255-1930 and ask to speak to one of our transplant physicians. Inactivated influenza vaccine should be administered beginning at least 6 months after HCT and annually thereafter for the life of the patient. Sequential administration of 3 doses of pneumococcal conjugate vaccine is recommended, beginning 3-6 months after the transplant, followed by a dose of PPSV. A 3-dose regimen of Hib vaccine should be administered beginning 6 months after transplant; at least 1 month should separate the doses. MMR vaccine should be administered 24 months after transplant if the HCT recipient is immunocompetent. If a decision is made to vaccinate with varicella vaccine, the vaccine should be administered a minimum of 24 months after transplantation if the HCT recipient is presumed to be immunocompetent. 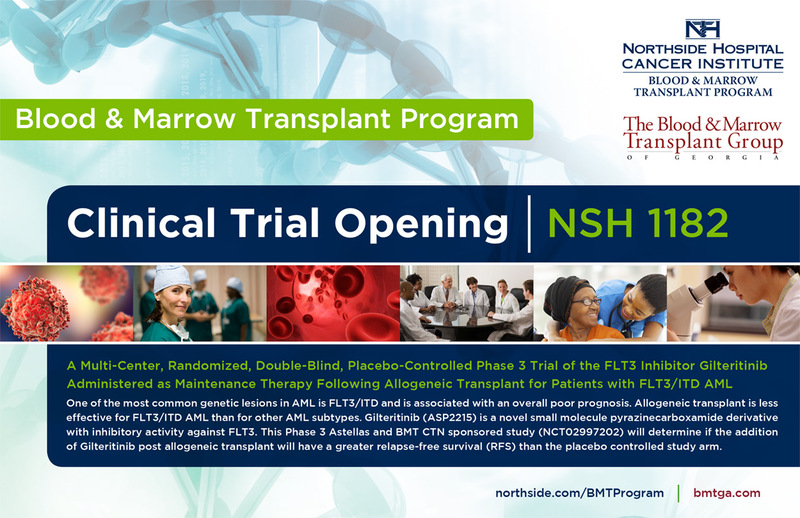 Please click here to view the NSH-BMT post-transplant vaccination schedule recommended for both autologous and allogeneic transplant recipients. For more specific information, see Tomblyn M, Chiller T, Einsele H, et al. Guidelines for Preventing Infectious Complications among Hematopoietic Cell Transplantation Recipients: A Global Perspective [1.9MB, 96 pages]. Biol Blood Marrow Transplant 15:1143-1238;2009 or visit http://www.cdc.gov/vaccines. Hesitant about donating platelets? 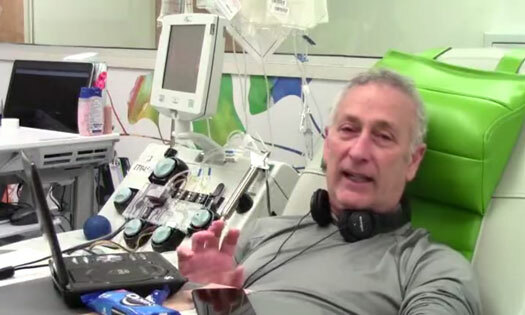 Our wonderful platelet hero Dave takes the guesswork out of donating! The process is very similar to donating whole blood, and with your donation you are giving the gift of life to an active blood cancer or blood disorder patient right here in Atlanta! Call 404-459-8744 and schedule your appointment to save lives today! 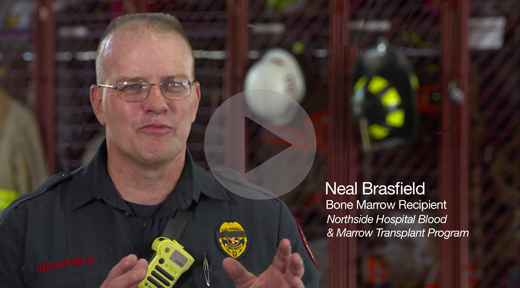 The Blood and Marrow Transplant Program at Northside Hospital (NSH-BMT) provides the best of both worlds — clinical excellence and compassionate care. 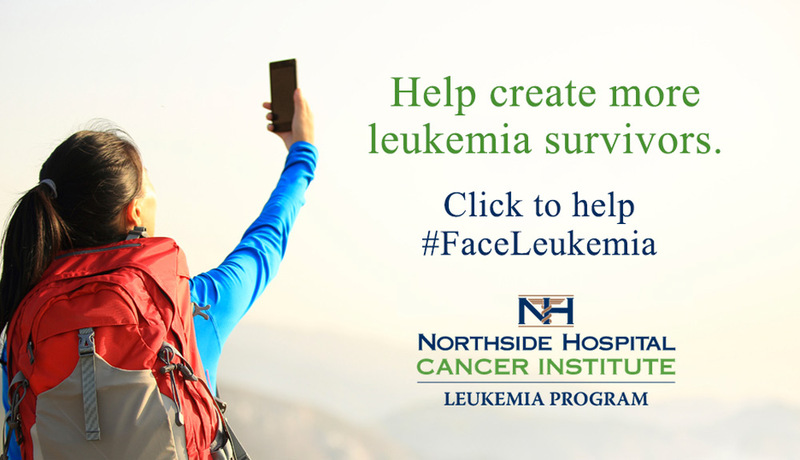 Committed to being the premier program in the Southeast, we provide outstanding state-of-the-art care for patients with leukemia and for those patients undergoing blood marrow and stem cell transplantation.